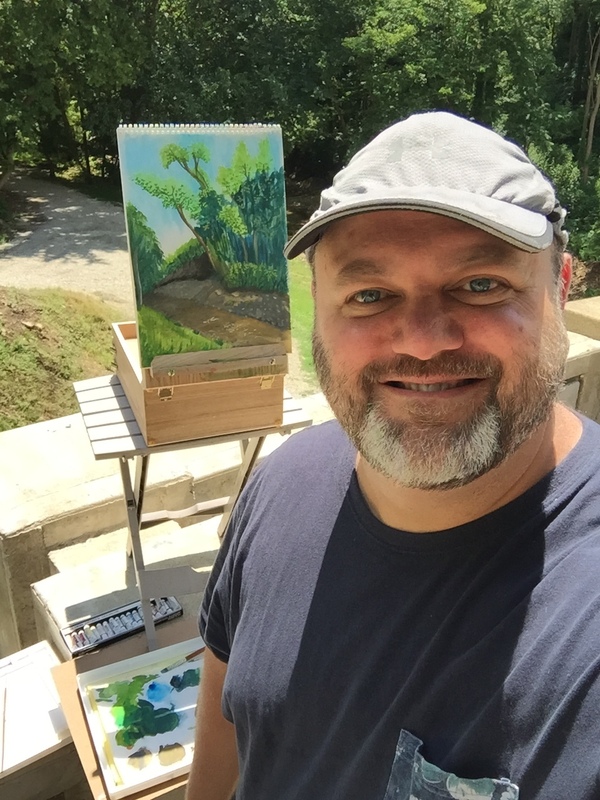 Plein Air in Dellwood Park - Lockport, IL. This was the second weekend of Plein Air 17 - hosted by the Illinois State Museum Lockport Gallery. I ventured over to Dellwood Park as I had not been there before and heard it was nice. I found this great spot on a lookout over what used to be a dam. It was perfect to hold my portable easel box and gave me a nice viewpoint of the small stream below. I bought a set of gouache artist paints during the week and this was my first chance getting to try them out. Heck it was my first time ever even using gouache paints. So it was fun to learn and experiment. The weather was great. Had a few nice folks come over and look at what I was doing and ask a few questions. But for the most part it was just peaceful and I was completely engrossed in what I was doing. After I packed up my gear and got home, I scanned the painting into my computer and then I began working on some details digitally, using brushes in Photoshop to mimic the gouache paint effect. (Brushes are from a set by Kyle T Webster). And I also worked on creating a more dramatic lighting by enhancing the darkness of the shadows and letting some more sunlight in. I really liked taking the work I had done, learning from it and building upon it. I am hoping this might lead to something interesting as I continue to look for and develop my own personal style in my work.